TRUSTWORTHINESS Be Honest. Be reliable. Do what you say you’ll do. Be loyal - stand by your family, friends and country. RESPECT Treat others the way you expect to be treated. Be tolerant of differences. Use good manners. RESPONSIBILITY Think before you act. Do what you are supposed to do. Be accountable for your choices. FAIRNESS Play by the rules. Be open-minded. Make decisions without favoritism or prejudice. CARING Be kind. Forgive others. Help people in need. CITIZENSHIP Be a good neighbor. Stay informed; vote. Protect the environment. Three Winnebago 4th Graders received Pillar Awards for Caring from the Bloomingdale CHARACTER COUNTS! Coalition. 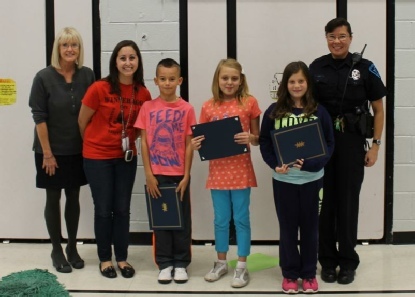 Szymon Adress Mazur, Ornela Lauzadis and Alex Ross (pictured left to right with representatives from the Coalition) were presented the awards during Winnebago's school assembly last Friday. When the three students learned that their neighbor's four year old grandson was sick with cancer, they sold lemonade and handmade bracelets, (with supplies purchase from their allowance) to give the little guy a toy and a handmade card, followed up with several play visits. On Friday, May 2, 2014, the CHARACTER COUNTS! Coalition recognized Fiona Hull, a 5th grade student at Winnebago Elementary School with a Pillar Award for Caring, for standing up for a fellow student in her time of need. 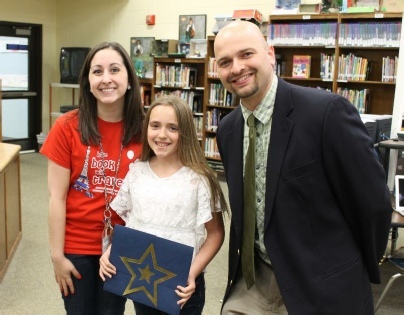 Fiona is pictured to the right with her teacher Laura Reece and Principal Jon Pokora. 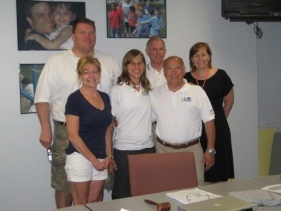 (l to r) Bill Bahr, Kandy Jones, Lisa Palmer, Mayor Coladipietro, Bonnie Rothbaum and Laura Reece. Lisa Palmer, the head of Youth Services, was presented with a Pillar Award for Caring by the Bloomingdale CHARACTER COUNTS! 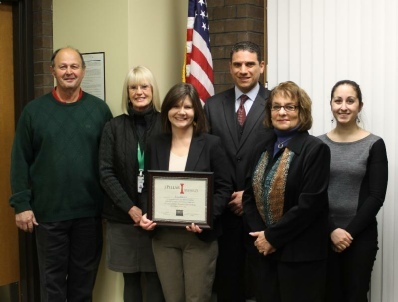 Coalition at the February 11th Library Board meeting. Last June, an 8 year old boy emerged from the library computer lab choking on a piece of candy. Lisa immediately jumped into action and administered the Heimlich Maneuver on the young patron. 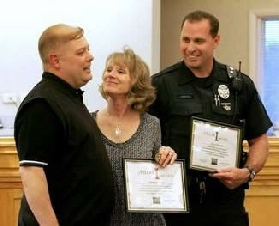 Lisa's swift action dislodged the breathing obstacle, and saved the young patron's life. Lisa's actions demonstrate the pillar of caring and the importance of first aid instruction and taking immediate action. 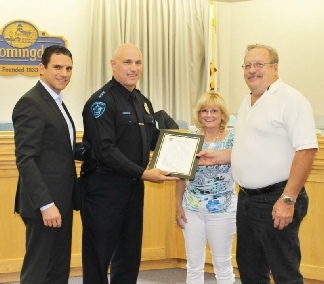 Residents Help Locate Missing Woman At Monday's [August] Village Board meeting, Susan and Keith Boehne were recognized with a Citizen Award of Appreciation from the Bloomingdale Police Department and a Pillar Award for Caring from the Bloomingdale CHARACTER COUNTS! Coalition for their voluntary assistance in finding a missing elderly woman. 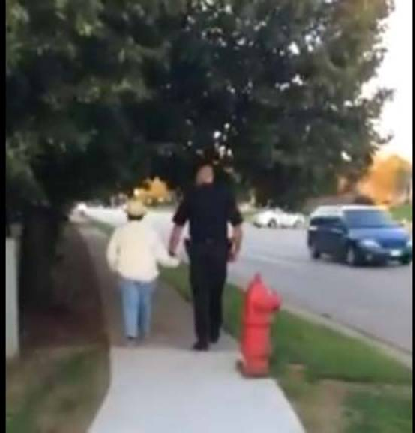 Last May the Bloomingdale Police Department received a report that an 86-year old female resident of a local assisted living facility, was missing. A search commenced immediately, including activation of the DuPage K-9 Unit, Cook County Police Helicopter Task Force, and a CodeRed message transmitted to area residents. After receiving the CodeRed message, area residents Susan and Battalion Chief Keith Boehne (Retired), formerly with the Bloomingdale Fire Protection District, responded on their own to help in the search. Fortunately, Susan and Keith soon found the elderly woman lying on the ground near a wooded area off of the 100 block of South Bloomingdale Rd. The Bloomingdale Fire Protection Dist. transported the woman to Adventist Glen Oaks Hospital, where she soon recovered after receiving some minor medical care, and was then returned safely to the assisted living facility. 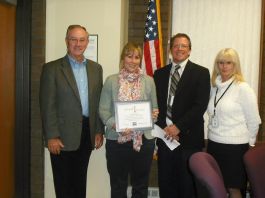 Shauna Porteus, head of the Bloomingdale Library business office, is the most recent recipient of a Bloomingdale CHARACTER COUNTS! 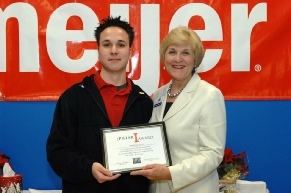 Pillar award. On Sunday, August 14th, a day the National Weather Service issued a Rip-Tide warning for Lake Michigan, Shauna was walking her dog along Lake Michigan. She saw three youngsters in the water struggling against large waves. They were not supervised by adults and as the situation worsened, Shauna jumped into the water to help the youngsters. The water was very rough, but she kept going out until all three children were returned safely to the beach. On shore the Chicago Police and Fire personnel were there to help once the kids were rescued. Shauna herself was bruised and scraped from being bashed against the rocks. 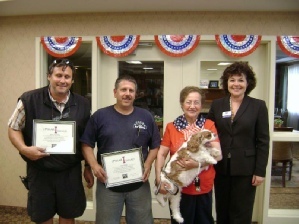 Shauna was nominated for the honor by Library Director Tim Jarzemsky, saying "...Shauna's heroic actions out on Lake Michigan seem to me to be an extreme example of caring. Not once,, but three times she put herself at risk to help save strangers..." Pictured (l to r) Mayor Bob Iden, Shauna Porteus, Library Director Tim Jarzemsky, and Kandy Jones, Bloomingdale CHARACTER COUNTS! Coalition. 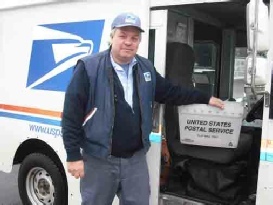 Those who know Bloomingdale Postal Carrier Daryl Miller are used to his quick smile, friendly manner and dependability. What they might not be aware of is his ability to handle an emergency with swift and decisive action. On November 29th, Daryl witnessed a driver traveling eastbound on Lake Street lose control of his vehicle, striking the side of Pickle Piano Company. Without hesitation, Daryl ran to the vehicle, taking immediate action to help the driver as the car's engine was roaring and apparently stuck in gear. He was able to assist the driver, who had been taken ill, away from the car as emergency personnel arrived on the scene. The Police Department commended Daryl for his swift action which contributed to this incident ending in a safe and positive manner. Police Chief Frank Giammarese thanked Daryl stating, "It is a noble act to help another in a time of need." Matt McAloon presented the award for Caring to Christopher Kalupa for his assistance to a victim at Lifetime on 12/26/10 before Paramedics arrived. Michelle Tipner - On September 10, 2009 a preschool aged child attending Erickson's Curriculum Night, separated from his parents and left the building. Michelle noticed the child walking alone at the corner of Schick Road and Springfield Drive and turned her car around and comforted the child while phoning the Bloomingdale Police Department. Michelle's observant call to action, uniquely represents the Pillar of Citizenship. 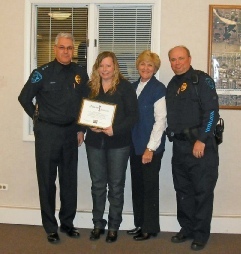 (Pictured right: Michelle receives her award from Police Chief Tim Goergen, Sherry Douglas, Bloomingdale CHARACTER COUNTS!® Coalition President, and Police Watch Commander Randy Sater). Arsalan Bin-Kamran - At approximately 5:15 pm on April 27, 2009, 12 year old, Arsalan Bin-Kamran was walking along South Brandon Drive in Glendale Heights (Bloomingdale Fire Dept. District) when he noticed a fire in the garage at 1953 South Brandon Drive. Arsalan knocked on the door to alert residents then he called 911 for assistance. Because of Arsalan's swift actions, damage to the home was contained mostly to the garage and the exterior of the home. Without Arsalan's help, the house would have sustained considerable damage were the fire to go undetected or unreported for much longer. Arsalan's act uniquely represents the pillar of Citizenship. 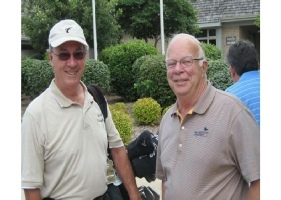 Don Helmig - As the General Manager of Bloomingdale Golf Club, Don has hosted the annual CHARACTER COUNTS! Coalition's recognition breakfast for as long as it has been in existence, refusing compensation for both the food and service provided. Don's commitment to the Coalition uniquely represents the pillar of Caring. 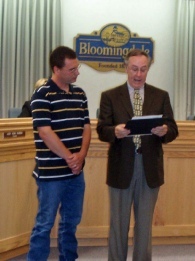 (Pictured Right: Don Helmig with Mayor Iden).